Thanbyuzayat War Cemetery, Plot A3, Row C, Grave 19, Age 27. 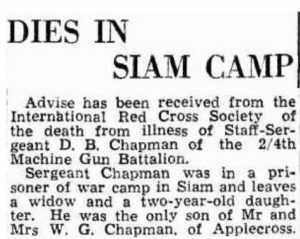 Soldier evacuated to 55km Camp from Aungganaung 105km Camp on 1.7.1943 due to an irregularly large 8 inch by 8 inch tropical ulcer that exposed bones and tendons on his right foot. Soldier’s right leg was amputated below his knee. The surgical re-amputation of stump was conducted due to gangrene. 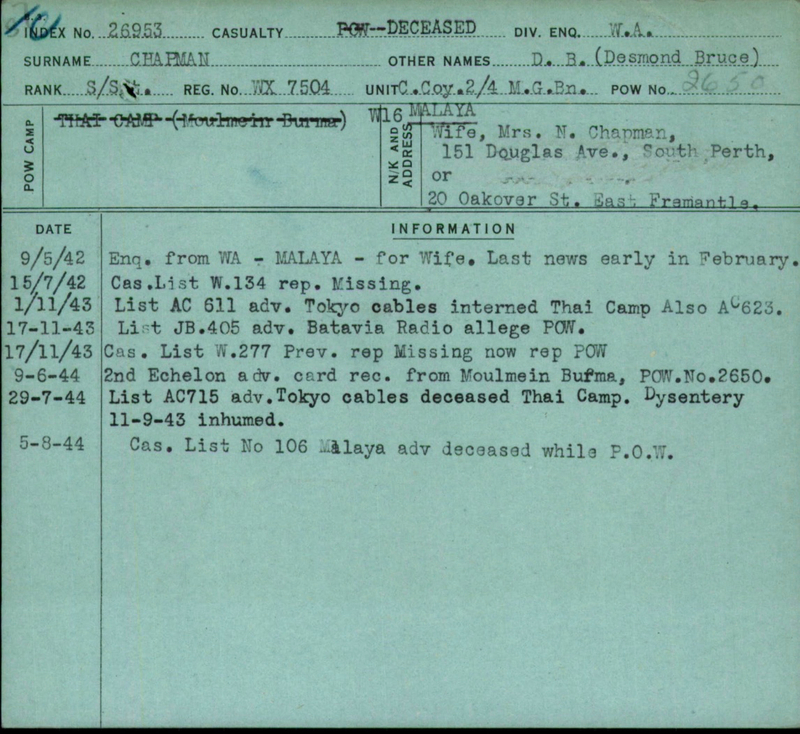 Already ill with tropical ulcers and dysentery, Des was unable to recover from his amputation and died on 11 September 1943. 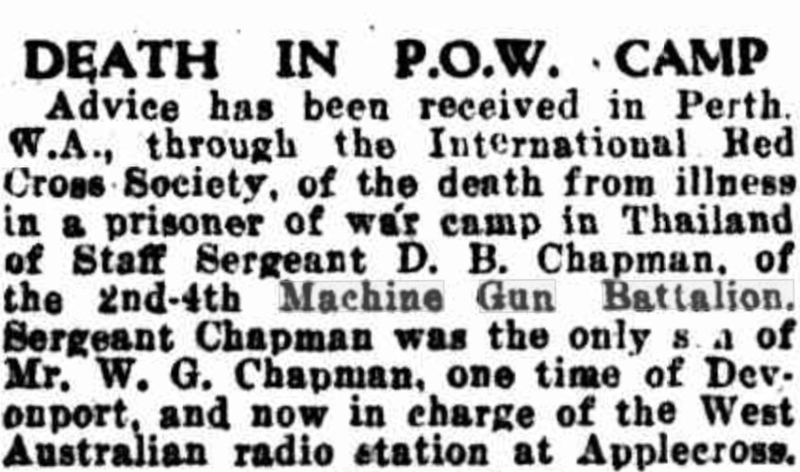 Another ‘2/4th boy’ died same day at Khonkan following his amputation, WX5050 John Arthur Briggs. Read about ‘A’ Force Burma, Green Force No. 3 Battalion. Bruce’s parents William George Chapman and Hilda Harriett Crowder married 1914 in South Australia. They were both born in Tasmania. Hilda died in Tasmania in 1922. Bruce would have been about 6 years old. He had one sister. 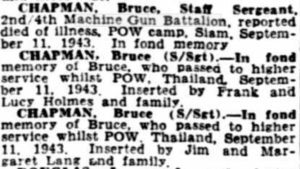 Bruce was a student of Wesley College, South Perth. 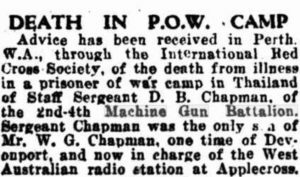 Bruce Chapman married Nellie Batt in 1940, a few months after enlisting. Bruce and Nellie had a daughter Janis Anne Chapman. 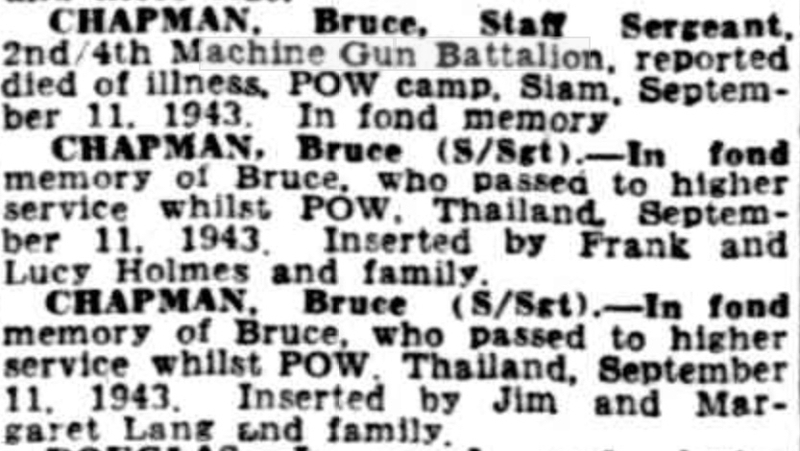 Bruce’s father William George Chapman died in 1957, Perth. Nellie Chapman remarried about 1948 to Alan Westerberg.